Did you know you can use WebGL in React? This week we're focusing on visualization libraries and code. You can render everything from maps, to 3d models, to comics - all with React. Be sure to try out the demos! gl-react is a set of WebGL bindings for React to implement complex image effects. It has a thorough set of examples, including blur, setting contrast-saturation-brightness, rotating colors and more. react-art - React Bridge to the ART Drawing Library. 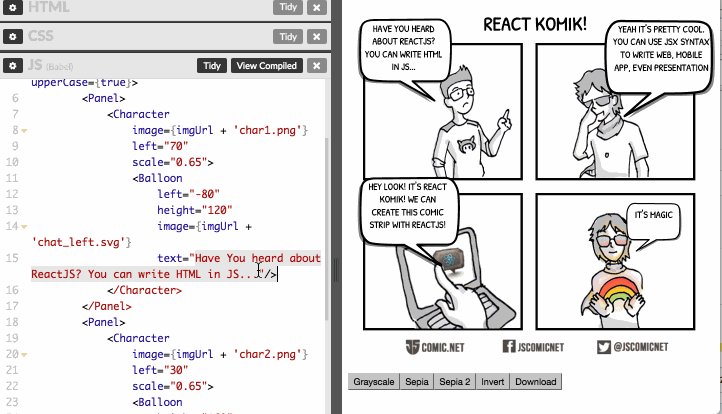 React Komic is a comic strip creator using React. You can find a demo here. react-three-renderer will render 3d content into a three.js canvas using React. You can play with some demos here. react-canvas - Flipboard's library to render React components to canvas rather than the DOM. Flipboard has achieved 60fps in their beautiful mobile app application with this library. You can read more about it here.